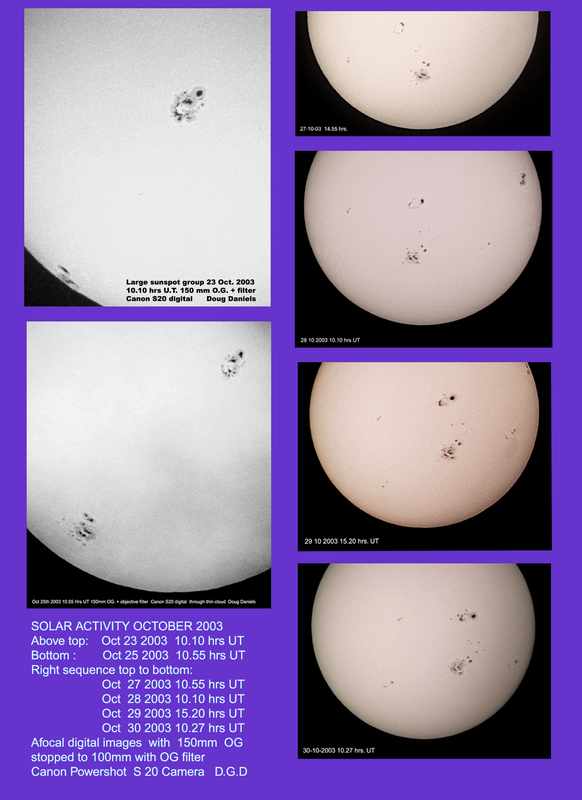 During the latter part of October 2003, the sun underwent a burst of activity which resulted in the formation of several large groups of sunspots, groups large enough to be seen with the naked eye (Through dense filters, of course). This sudden and unexpected activity - unexpected as it is three years past solar maximum, fortunately corresponded to a week of unseasonable good weather. This allowed continuous daily observation of the sun and a record of the developing activity. My observations began on the 23rd of Oct. A large complex spot group was already well on the solar disk and another one following, was just visible on the limb. This group was reported to be associated with a huge prominence, observed by a colleague with a Solar Max telescope. As this second group moved further onto the disk, a small circlet of spots developed above it, first seen on 27th of Oct. Over the next three days, this group developed sufficiently to become yet another naked eye spot. All of these events were accompanied by intense flares and particle emissions. Terry Pearce and Paul Clements reported a strong aurora visible from Weston Coleville in Cambs on the night of 29th of October, unfortunately it was cloudy in London. Observations continued until all the spots had moved off of the solar disk by the 3rd of November.